For a limited time, we will double your fat reduction at NO ADDITIONAL COST to you by adding a second round of SculpSure treatments free! Buy as many applicators as you want and we will give you one free for EVERY one purchased! 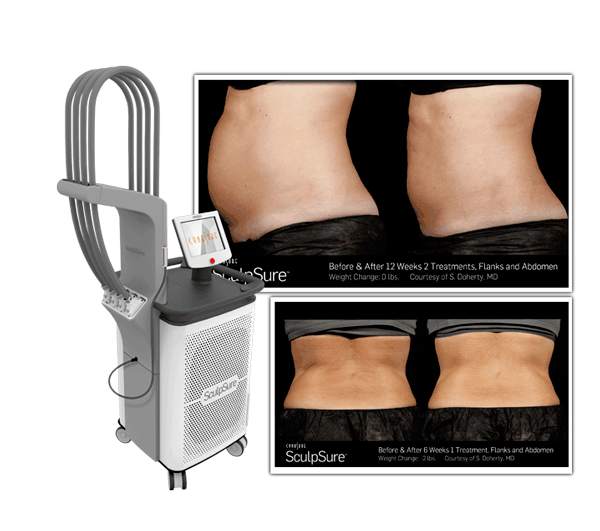 SculpSure – Destroys Fat & Tightens Skin Too! FREE Second Round of SculpSure eliminates another 24% so you can lose up to 48% of your fat! Exilis Ultra Skin tightening treatment included with every treatment – a $399 value FREE! Over 3,000 Cases performed – See our real Before & Afters! Additional SculpSure treatments can reduce your fat even more. We are priced less than anyone else and have done more treatments than anyone else in Florida. And now, for a limited time, we are doubling SculpSure fat reduction results with your second treatment free! There has never been a better time to get the body you really want! We offer additional treatments to you at no cost to enhance SculpSure, because great results matter. Acoustic Shockwave Therapy following SculpSure – Supoerchages lymphatic system to allow the body to flush out dead fat cells. Exilis Ultra – Radio Frequency Skin Tightening Treatment – Helps further tighten skin and stimulate treatment area. We are the ONLY Center in Palm Beach County with the new Exilis Ultra and the only center to use this device in combination with SculpSure. And best of all, we add Acoustic Shock Wave and Exilis Ultra to SculpSure at NO COST TO YOU as part of the Advanced Protocol! A breakthrough in body contouring. FDA Clinical trials proved that SculpSure was effective at eliminating fat cells by specifically targeting and damaging fat cells which then are absorbed by the body. Even with diet and exercise, most people have stubborn pockets of fat that seem impossible to lose. SculpSure’s body contouring technology is able to target and destroy these fat cells in just 25 minutes without affecting the skin’s surface. Over time, these damaged fat cells are naturally absorbed and removed from the body, with results seen as quickly as six weeks, and optimal results typically seen at 12 weeks.